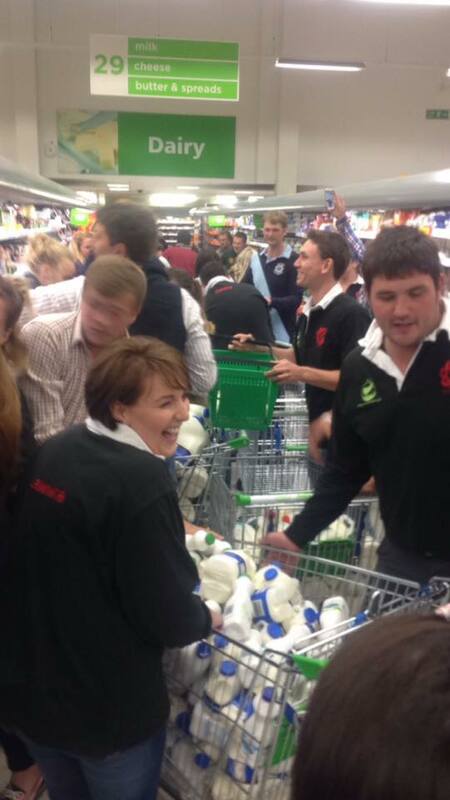 YOU’VE BEEN MILKED: Members of Wareham and Purbeck Young Farmers Club and others empty the milk shelves of Asda’s main Poole branch. The branch manager was said to have been caught off guard by the protest. Picture by Elise Axon. TROLLEY DASH: Protesters take the trolleys full of milk out into the car park. They handed it out to customers informing them the milk might not be on the aisles in a few months if they are not there to produce it. Picture courtesy of Puddletown Young Farmers. 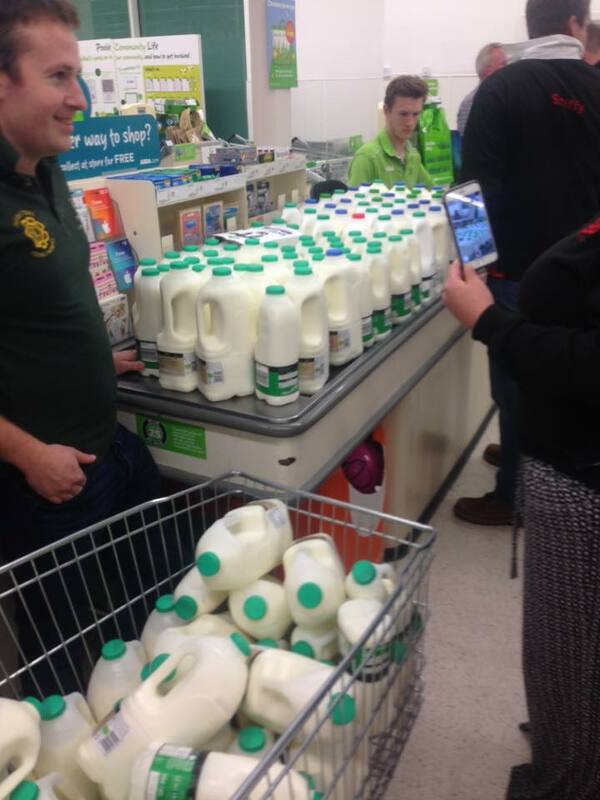 POOLE’S biggest Asda supermarket branch was targeted by dairy farmers today in their ongoing protests to highlight the price they are receiving for milk. A friend of mine who happened to do some shopping that night, called me and I got down as quick as I could to find out what was going on. 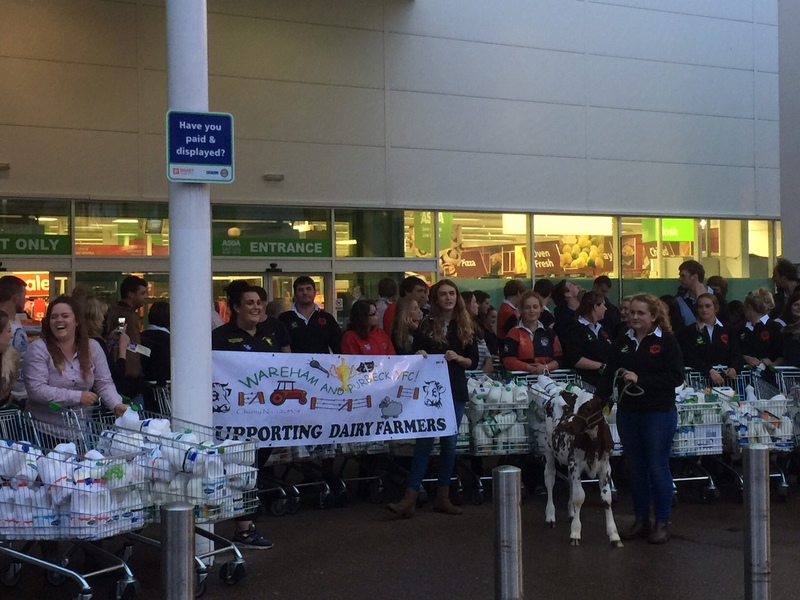 Fifty members of the Dorset farming community, including members of Puddletown and Wareham and Purbeck Young Farmers Clubs, and others from Blandford, Wareham and Swanage bought all the stock and handed it out to customers in the car park. They were explaining to the public that the shelves were being emptied to illustrate what will happen if they were not there to produce it. As the protest was underway, it emerged the retailer had pledged to pay 28p for liquid milk through its entire stage and had asked to its processor supplier, the co-operative Arla to factor this in. The word on the ground was that they wanted more details to be convinced. Amongst those present was Paul Dyer of Swanage. He and his family have a 100-strong Holstein-Friesian herd just outside the town. This has led to wholesale prices slumping and has in turn effected the price farmers receive for their milk, but also lamb, beef, pork and other mainstay grocery items. However with the world being a volatile with potential threats to the supply chain to supermarkets due to union protests and migrant contamination of HGVs with perishable goods, some have argued that food security is not being taken seriously. Between August 2014 and August of this year there has been a 10.2ppl (pence per litre) reduction in the cost of milk. This is a drop of 23 per cent. Whilst much of the protests has been on liquid milk, that constitutes 50 per cent of the market, the rest is used for cream, condensed milk, milk powder, yoghurt, cheese and other products. The protesters say the branch manager and his staff were “gob-smacked” as they were not expecting to be singled out. Another large supermarket branch in Yeovil was “tipped off” about a planned protest and made contingency plans to prevent bulk purchases of milk. Mr Dyer said: “We work very hard to produce we do and we are not prepared to see it devalued. It is absolutely desperate. “We are losing 8p to 10p a litre and we are receiving 23p per litre. 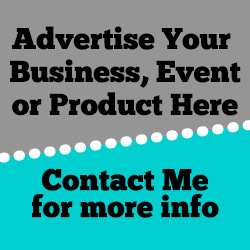 We are losing £6,000 to £8,000 every week – that is the equivalent of £80,000 to £90,000 a year. Mr Dyer urged consumers to find out more about what dairy farming entails and to look carefully at the labelling to ensure they were buying 100 per cent UK produce. He also pleaded with Environment Secretary Liz Truss and Defra to act to protect food security and has backed an announcement by Bridgwater MP Ian Liddell-Granger to push a Private Members’ Bill making it mandatory for supermarkets and processors to pay their suppliers cost of production prices for their produce. He said “The public have been very sympathetic and are more than willing to pay more so that we can get a return on our milk. People understand where we are coming from but they don’t understand how much work goes into producing it. “I milk my cows twice a day, seven days a week and have to get up at 5am. I think consumers know about the Red Tractor logo but you have to look at where the produce comes from. It may be packed in the UK but come from abroad, or it might say packed in the UK but produce of the UK and Ireland. Look for the Red Tractor logo on milk, butter, yoghurt, ice cream and cheese. This will be on other produce such as lamb, beef, pork, chicken, duck, fruit and vegetables. Ask your supplier how their sourcing policy supports dairy farming and for that matter other sectors as well in the UK. We are proud of our fair trade with other countries. We should ensure that our farmers get a fair deal for their produce!!!!!!!!! !